There are few things sweeter than a handwritten love note. 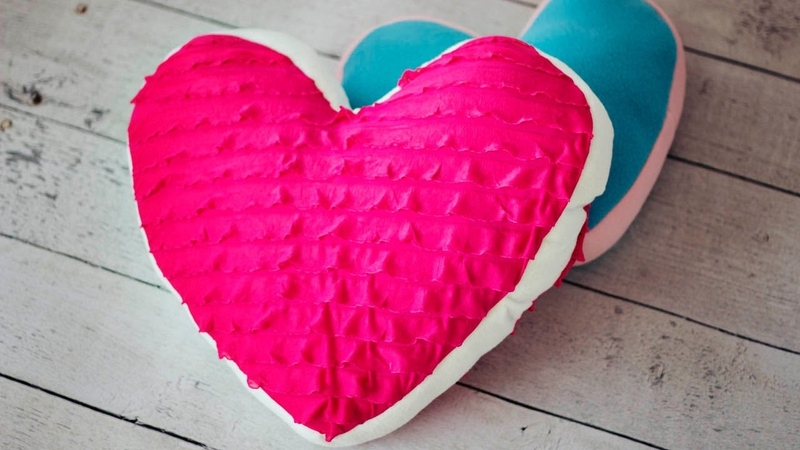 Make the delivery all the more special with this pretty stuffed heart. There’s a tiny pocket on the back perfect for tucking away a secret message – for someone you love, or even just for you. It’s easy to make and you can mix and match your favourite fabrics, ribbons and buttons for an individual touch. Hide your heart under your pillow or hang it somewhere for all to see. And you can spread the love too, because these little hearts make wonderful gifts for the special people in your life. Draw a heart template on paper, approximately 16cm wide and 14cm high and cut it out. Chose two pieces of fabric that you would like for the biggest heart shape and pin the template to these. Cut around the heart template so you have two heart-shaped pieces of fabric. Using the same template, draw a smaller heart within the boundaries of the larger one, and a smaller one again. Trace these two hearts onto the fusible bonding and cut roughly around them. With a hot iron, press the fusible bonding onto the wrong side of two more pieces of fabric. Then cut out the heart shapes so that you have two fabric hearts with the ironed-on bonding. Finally, with your fifth piece of fabric, cut a small square 10cm by 8cm. You should now have two large matching heart pieces, a medium-sized and small-sized heart with bonding on the back. Take the two pieces with bonding on the back and peel the paper off. Position the medium-sized heart on the large piece of heart-shaped fabric (this will be the front of your heart). Using a hot iron, press these two pieces in place. The two pieces should now be adhered. Repeat with the smallest heart, positioning it on the medium-sized heart. Using the thick black thread and a straight stitch on your sewing machine, sew around the two smaller hearts close to the edge of the fabric. Take the square piece of fabric and fold one of the long edges over 1cm and then 1cm again. Press. Using coordinating thread in your sewing machine, stitch along this edge. Press the other three edges under 1cm - this is the heart's pocket. Position the pocket on the large heart piece so that it sits on the back of the heart and sew close to the folded edge on these three sides. Decorate your pocket with various colourful buttons if you choose. Place the back of the heart right side up. Fold the ribbon in half and position it down the centre of the heart, with the raw edges hanging slightly over the top centre of the heart. Place the front of the heart facedown on top, matching up the sides. The ribbon should be sandwiched between the two heart pieces. Using a small straight stitch and leaving a seam allowance of 0.5cm, sew the two hearts together, being sure to catch the raw edges of the ribbon at the top of the heart only. Leave an opening of about 4cm. Clip the curved edges of the heart, being careful not to cut through your stitching. Turn your heart inside out, gently pushing out the seams. Stuff firmly. Using a needle and thread, sew the opening closed with a slipstitch. Tuck a love note into the pocket. ​If you don’t have a sewing machine, it would be possible to do the stitching by hand. You could even use embroidery thread to embellish the appliqués. Personalise the heart by embroidering the initials of the recipient on the back. ​ Greer Worsley is a working mum whose desire to make and bake things has grown in inverse proportion to the amount of spare time she has since her three gorgeous girls came along. Read more about the fun, chaos and occasional craftiness at her blog, typically red.